Our latest programme cover for Norwich City pays tribute to Timm Klose and the dramatic nature of his goal in last weekend's clash with Ipswich Town. When Klose jumped up in the 95th minute to head the ball into the back of the net, the home fans erupted into complete euphoria. The equaliser denied Ipswich possession of the local bragging rights and continued the Canaries' run of 10 games unbeaten in the East Anglian derby. The cover artwork has been produced by Norfolk-based graphic designer Myles Hunt who has created an abstract illustration capturing Klose in full celebration moments after heading in the equalising goal. What better way to follow up such an exciting moment at Carrow Road than visualising it with a lasting piece of artwork to remember forever. 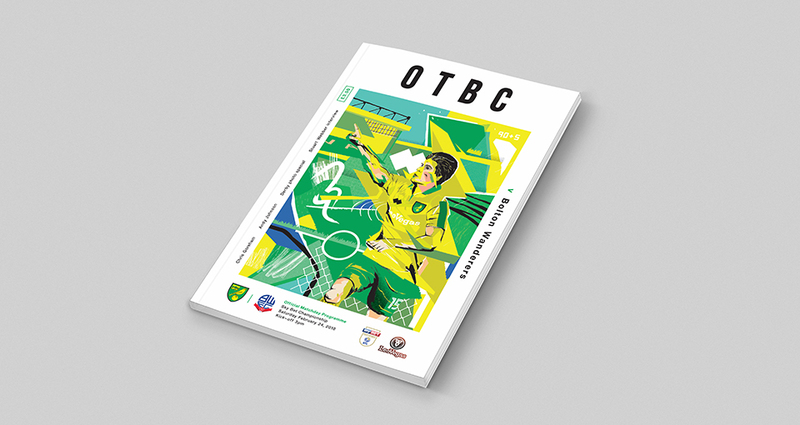 "I was thrilled to be asked to submit an illustration for a Norwich City programme cover as I’ve followed the project throughout the season and really enjoyed seeing the different artistic styles on display. My piece is an illustrated drawing of Timm Klose celebrating his equalising goal in the derby match v Ipswich last weekend. I tried to capture the passion and excitement surrounding the goal by using abstract shapes and patterns associated with the crowd, pitch and stadium. Hope you like the artwork and it serves as a visual memory for such a memorable moment this season."